Sometimes you have to pull the schedule apart and put it back together as something completely different, but just try to use the same number of "writing" pieces as you did before. It may not look like the picture on the box, but life is kind of like that. Also I may have watched the Lego movie recently. Kiddo is currently on spring break, and the writing hours I've lost to the extra wrangling have finally caught up with my blog update schedule. I'll have no kid wrangling hours for a long weekend, and it looks like a lot of my writing is going to "clump" in that direction. I have a guest post for tomorrow. Certainly having the weekend free from one of my three day jobs means I'll have something by then. And tonight, very late, you may see a mailbox go up if you're watching closely (and I don't come home too exhausted and decide to put it off to the weekend). Folksy didactic lesson? But of COURSE I have a folksy didactic lesson! Look at me. (Well okay maybe not that ridiculous picture, but just the idea of me.) I make half my income from writing and the weeks that go according to plan are overwhelmingly the minority. I am constantly writing an hour one day and seven the next or grabbing forty-five minutes for a week and then doing a marathon session of writing on the weekend that would make a Netflixer tap their closed fist to their chest in respect. Maybe if writing is your one and only job and you have no other obligations, and you never have to deal with kids, and you can either leave the house to go write somewhere like it's a job or you somehow actually convince the people around you that writing time is really actually work and they shouldn't feel free to bother you, then MAYBE you can get that awesome schedule that is exactly the same every day to work out more often than not. Of course we all want our quiet, sacrosanct 4-6 hours every day without interruption or variation. But it's a lot more likely that you're going to have to learn to roll with the punches until/unless writing is your day job, your only job, and everyone around you treats it like it's your job. 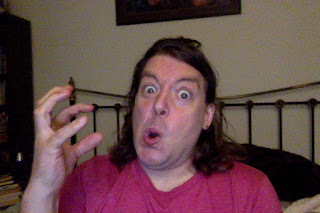 I try to write at the same time every day, but I constantly have to be ready to do my due diligence for a "day's writing," throw up some jazz hands to get an update going, and then turn around and write thrice as hard a couple of days later.